The cat's mouth had been taped shut. A pet cat and dog are recovering after they were rescued from a freezing-cold Calgary storage unit, discovered in kennels buried under piles of boxes last Friday. A detective told Global News that black tape had been used around the cat's head to tape its mouth shut. Police said they were called to the storage facility unit in the city's southeast after staff said they could hear sounds coming from the unit. "It was very clear to them, it was the sounds of a dog and a cat," Det. Andy Nguyen told CBC News. Nguyen said police cut the lock and had to dig past boxes and other items before finding the animals, who were both in travel cages. The animals were taken to the Calgary Humane Society, who confirmed to the Calgary Sun that both pets are now "in stable condition." 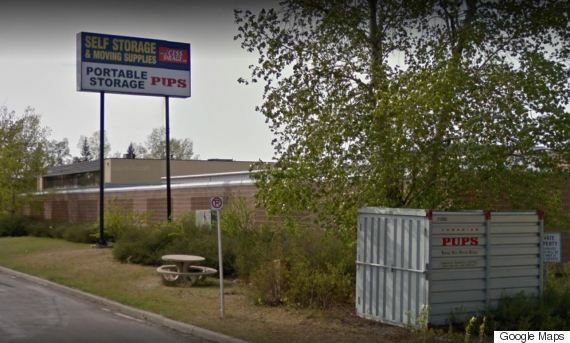 Nguyen confirmed to the Calgary Sun that the person renting the storage unit has an outstanding animal bylaw warrant on an unrelated matter. He said investigators are determining whether charges will be laid. "It was very clear to them, it was the sounds of a dog and a cat." This case is reminiscent of the 2014 deaths of a cat and dog that were found emaciated and with their mouths taped shut a few days apart in the same alley in southeast Calgary. A man in that case was charged, however, police have not confirmed any connections between last week's finding and any previous reports of animal abuse in Calgary. A downturn in the Alberta economy, largely driven by a drop in the price of oil, has meant an uptick in the surrender of animals, as people are forced to part with their pets.